Benny Bell (born Benjamin Samberg or Zamberg, March 21, 1906 вЂ“ July 6, 1999) was a Jewish American singer-songwriter who reached popularity in the 1940s, with a comeback in the 1970s. He is particularly remembered for his risquГ© but cheerfully optimistic songs. Benny Bell was born to an immigrant Jewish family in New York City and like many others who were born and raised on ManhattanвЂ™s Lower East Side, Benny BellвЂ™s first language was Yiddish. 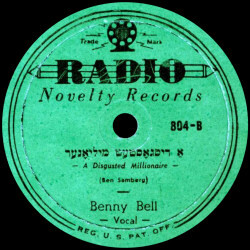 His father wanted him to be a rabbi, but after trying various odd jobs including self-employed street peddler, Benny Bell decided to pursue a career in vaudeville and music, because he found employment writing lyrics for music and also music for lyrics. After this initial introduction to "show business" Benny Bell took to the Vaudeville stage as 'Benny Bimbo'. Making people laugh was what he was all about. His first record, "The Alimony Blues" (backed with "Fast Asleep on a Mountain"), for Plaza Records on December 16, 1929 was a comical song about preferring to spend time in jail rather than pay alimony. In addition to songs with English lyrics, he also wrote and recorded in Yiddish and Hebrew, sometimes mixing two or even three languages in one song (i.e. "Bar Mitzvah Boy" which uses all three). According to liner notes on his albums, these multiple-language songs are intended to be understood by listeners who speak any one of the languages used. 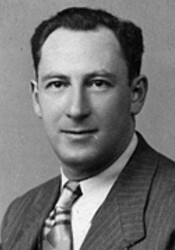 Benny founded his own record company under a variety of names: Bell Enterprises, Madison Records, Zion Records, and Kosher Comedy Records, to release his own material. He also wrote and recorded commercial jingles for radio. His jingle for Lemke's cockroach powder, sung in a mixture of Yiddish and English, has been released on record. In 1946 he released his two best known songs: "Pincus the Peddler" which drew from his personal experience in the trade, and the notorious "Shaving Cream". "Pincus the Peddler" became Benny's signature tune, despite the title character's disreputable violent tendencies, and it concludes with his deportation to Petrograd (the older name for Leningrad, known today as Saint Petersburg, Russia). The original version of "Shaving Cream" was issued on Benny's record label with Phil Winston on vocals under the pseudonym Paul Wynn, and as that name was also used by Bell himself, Winston's version has often been mistaken for Bell's, and has appeared on Benny Bell compilation albums more frequently than Bell's own version. "Shaving Cream" uses a technique in which each verse suggests a rhyme with a certain rude word, but drops two beats before the chorus, which replaces the word with the title. The same concept was used in "Sweet Violets" and many other songs that Benny recorded. As the first half of the 20th century passed, so did the interest in Yiddish comedy. The 1950s were difficult and Benny Bell was forced to accept menial jobs like bus boy and bank messenger. But when a syndicated LA disc jockey began using Benny BellвЂ™s song вЂњShaving CreamвЂќ as his theme song in the 1970вЂ™s, it renewed interest in his earlier recordings from the 1930s. вЂњShaving CreamвЂќ was eventually reissued, selling almost a million copies. His renewed popularity breathed new life into his live performances which he continued to do into his 90вЂ™s. Benny also continued self-releasing vinyl albums into the 1980s, and they often resemble 1950s releases, featuring somewhat plain covers with the same graphics (an array of laughing heads) re-used for decades, or with no art except a plain cover with hole to view the label. He continued to issue 10-inch albums long after that format was considered obsolete. Some albums have new spoken jokes edited into breaks in older songs as "asides", a technique Bell had been using since the 1950s, and some songs contain comic interruptions made over several decades.